When I try to buy the full version of Paprika 3 it says "Billing service not available". I'm getting a HTTP 401 error when syncing. I receive a "no peer certificate" error message when syncing. I'm having trouble pasting into the ingredients or directions fields. Sometimes it takes the Play Store a while to detect the purchase on another device. Please wait a bit, then try restoring the purchase again and it should pick it up eventually. 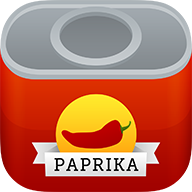 Also, please ensure that on the other device you're logged in to the Google Play Store using the same account you used to purchase Paprika 3 for Android initially.